I wonder what comes to mind when you read that sentence. How did you know he was a pastor? What does he do that makes him a pastor? How did he get to be a pastor? What even makes him eligible? We grow up in our various persuasions/traditions/denominations and our perception of a pastor may vary. If you are of the opinion that the Bible is not the infallible, unerring Word of God, then your opinion is as good as anyone else’s, is it not? But if the Bible is absolute truth; if it can be trusted to define this crucial work, then we can dig in it to uncover the Mind of the God of the Bible on this topic. I would like to attempt that. The commentaries generally group 3 epistles together. They are 1 Timothy, 2 Timothy and Titus and are generally referred to as the “pastoral epistles”. They are rich in instruction as to the character and work of the pastor. But what else can we learn about the pastor according to the whole Bible? Does this not equate “pastor” with “shepherd?” Does the Bible not use the work of the physical shepherd as an example for the spiritual shepherd? In the word of God, a pastor is a shepherd, he cares for the sheep, literally or figuratively. In his excellent book “A shepherd looks at the 23 Psalm” Phillip Keller describes the work of a literal shepherd and extrapolates it to examine the figurative or spiritual shepherd. Sheep must be fed. Sheep must be tended, guided, lead, protected… lost sheep must be sought. Shepherds more concerned about sheep are commended and encouraged. The Shepherd in Psalm 23, John 10, and Matthew 18:12–13 is viewed in a positive light. Shepherds more concerned about shepherds are rebuked. In Ezekiel 34 the bad shepherds (if they can be called shepherds at all) are described. In 1 Samuel 16:11 David’s father tells Samuel regarding David “behold, he keepeth the sheep” using the same work translated “pastor” 8 times in Jeramiah. Again, same word. David was to shepherd people. Then in Psalm 23 David acknowledges being shepherded by the Great Shepherd… the Chief Shepherd… The Lord, using the same word. The Shepherd is responsible for the sheep, whether Jacob of Gen 31, or the bad shepherds of Ezekiel 34. Many kings saw their responsibility to care for their people as a shepherd might his sheep. Pharaoh saw the value of Joseph’s connection with God. He perceived the presence of the Spirit that allowed Joseph to prophesy the future and formulate a plan to save his care… his nation. Would this not be necessary in a shepherd of people in the New Testament as well? John 3:3 (KJV 1900) — 3 Jesus answered and said unto him, Verily, verily, I say unto thee, Except a man be born again, he cannot see the kingdom of God. John 3:7 (KJV 1900) — 7 Marvel not that I said unto thee, Ye must be born again. But he was humble enough to accept the Saviour’s requirement and after the crucifixion we see him caring for the body of his Lord. John 19:39–40 (KJV 1900) — 39 And there came also Nicodemus, which at the first came to Jesus by night, and brought a mixture of myrrh and aloes, about an hundred pound weight. 40 Then took they the body of Jesus, and wound it in linen clothes with the spices, as the manner of the Jews is to bury. Can you shepherd God’s people without “having the Spirit of God dwell in you” or “being a new creation” or “being born again”? 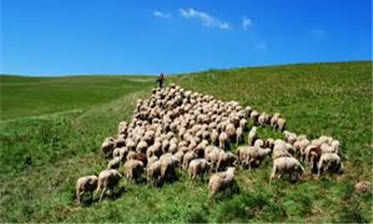 Can you be an under-shepherd to the people of God without a Spiritual connection to the Great and Chief Shepherd who’s the sheep are? No! But if you pretend to be, you will be held responsible! Let all who purport to be “pastors” examine themselves! Do you have the Spirit of God indwelling you? Has that Spirit given you the tremendous gift of a shepherd’s heart? One thing is clear today, as throughout history. The world is in desperate need of true shepherds and Godly shepherding. apportion on The Father’s Well Done! Copyright © 2019 Christian Bible Truth. Powered by WordPress. Theme: Spacious by ThemeGrill.